We have published a list of Hastings’ top 100 children’s books after being voted for by children and families across the town..
Hastings 100 Reads is part of the recently launched Get Hastings Reading campaign. The list features books for children of all ages, from early years through to teenagers. Lots of popular contemporary authors, such as David Walliams and Jeff Kinney, made the list, but it has also uncovered a local love for classics such as Enid Blyton’s The Famous Five and The Lord of the Rings by J.R.R. Tolkien. The children of Hastings have also revealed their passion for learning with non-fiction books, such as the Horrible Histories series and Good Night Stories for Rebel Girls by Elena Favilli and Francesca Cavallo, making the list. 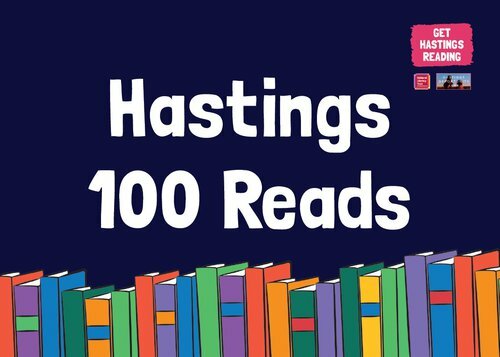 Hastings 100 Reads will inspire local children to both enjoy reading and to try a wider variety of books that have been recommended by their peers. Town residents were invited to share their favourite children’s book through entry cards distributed to local schools, and in doing so were entered into a prize draw to win a bundle of children’s books. Submissions were also accepted on the Get Hastings Reading website and the winner of the draw will be announced this April. You can download the list here or download the booklet here and children and families are encouraged to read as much of the list as they can and check off titles as they read them. The books have been ordered by recommended reading age, but this is only intended to be used as a guide. Children are encouraged to try any book they feel comfortable reading and to ask their teacher or librarian for advice on choosing the right book for them. Most of the books can be borrowed for free from libraries across Hastings and St Leonards. Information on joining the library can be found by visiting eastsussex.gov.uk/libraries.